The traditional business segment of INNOVATEC// Gerätetechnik GmbH is the production of electrolytic ozone generators for the production of purified water in the pharmaceutical industry. In a joint project with the university Bonn-Rhein-Sieg and the German Aerospace Center (DLR),which was funded within the KMU initiative by the German Federal Ministry of Education and Research, the micro disinfection system was developed. It is designed for decentralized disinfection of water distribution systems. Existing systems add ozone in central positions of water storage and distribution systems (treatment plants). The newly developed micro disinfection system can be installed in any microbiologically critical location and ensure germ-free water quality through controlled ozone dosing as needed (ozone microcell). The new system only generates as much disinfectant as required. The first component is the ozone microcell with extended service life owing to the new CH+ cell hearts (longlife-technology). With the new cell design the ozone microcells can operate in drinking water quality, containing dissolved ions like hardness components Ca2+ and Mg2+, for at least 1.500 hours with a current of 200 mA (>1 A/cm²). Cell voltage and current efficiency stay constant during this period. The production rate of the system can be controlled within seconds by adjusting the cell current. The installation of the cell in flow-through pipes enables efficient ozone dissolution in the water. The CH+ design modifies the flow of ions in the electrolysis system in such a way that the growth of hardness deposits in the current path is minimized and the cell voltage is stabilized at constant ozone yield. An additional benefit of this new technology is the downward compatability. The new CH+ cell hearts can be retrofitted into existing systems. The design is registered for patent approval nationally and internationally. 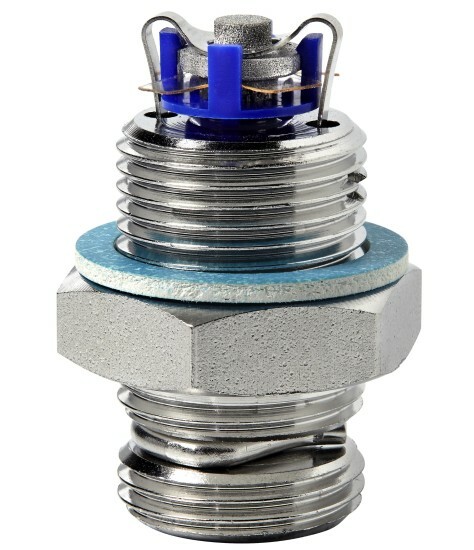 AbsolutO3zone – Potentiometric sensor with innovative, dry reference electrode. This design is particularly suited for monitoring ozone concentrations in purified water. DiffO3zone – Allows very quick measurement of the ozone production rate and/or the ozone dissipation in flow-through systems by a differential measurement. DiffO3zone is available for electrically conducting as well as for purified water. All sensors are registered for national and international patent approval. The project is supported within the KMU funding initiative of the German Federal Ministry of Education and Research (BMBF) gefördert. 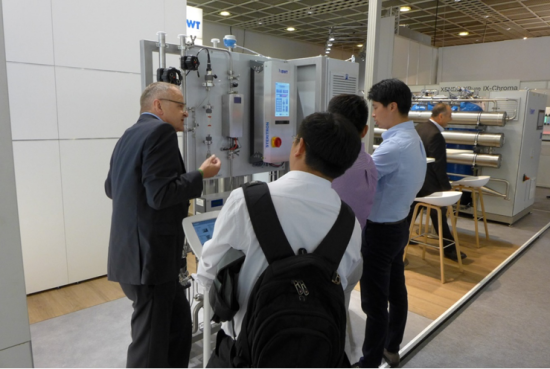 The technology was already presented on the PHARMA-Lounge and the ACHEMA 2015 by our business partner BWT (see picture on the right). Commercial launch is scheduled for end of 2016. If you need further information please contact us. BWT Pharma & Life Science on the ACHEMA 2015: Dipl.-Ing. Axel Ludwig explaining the STERITRON 4000, equipped with the new AbsolutO3zone and DiffO3zone sensors. The project was carried out with the collaboration of Bonn-Rhein-Sieg academy and German Aerospace Center.